Pulkovo Observatory, St. Petersburg, Russia. Received December 4th, 2009; revised January 12th, 2010; accepted January 17th, 2010. Electrical circuit analogy can be effectively used in termophysical applications . Ohm’s and Kirchhoff’s laws are work in equivalent schemes with lumped parameters; heat fluxes are analogues of currents, heat conductivity (or heat resistance) is analog of the electrical resistance, and temperatures are analogues of the electrical potential. The purpose of this work is to use this method for development of the integral analytical model of the heat balance based on the equivalence scheme for the system the surface—the atmosphere—the open space describing heat processes clearly. Variations of surface and atmospheric radiative parameters and atmospheric transparency for the surface radiation have important influence on the Earth’s climate. The simplest and convincing explanation of calculated dependencies is obtained with conversion from radiative characteristics to specific heat conductivities. In this work we have restricted with analysis of how atmospheric transparency for the heat IR radiation from the surface influences on the climate. It is a topical problem, because nowadays this transparency is regarded as one of the cardinal factors making the climate. To reach the general result, we are investigated all range of the possible transparency changed from 0 to 1. Method of the electrical circuit analogy can be used for a system of isothermal bodies having small heterogeneities, its make it possible to establish connection among schematic nodes with heat conductivities, and nodes define temperatures. In other words, the electrical circuit analogy can be used for the heat exchange problem and can’t be used for the heat conduction problem. So we regard the atmosphere as the homogeneous cover for the surface. The assumption is adopted that all atmospheric heterogeneities on the vertical dimension (pressure, density, temperature profiles) don’t influence on heat conditions of the underlying surface. We operate the surface temperature averaged on the whole surface (including the land and the ocean) and the atmospheric temperature averaged on the atmospheric volume. These simplifications are brought to the idealized model of the system which contains the isothermal spherical core inside the isothermal spherical cover. The heat sources caused by the incoming solar radiation acts on the cover surface and in the cover (in W/m2). These heat sources are uniformly distributed. In generally accepted practice the absorbed heat fluxes averaged and uniformly distributed on all the spherical surface are used . It is reasonable by the Earth’s rotation around terrestrial axis, and assumption is adopted that speed of this rotation is greater than warming or cooling rate (in days-1). In other words, the Earth’s orbital period is considerably smaller than the value of the thermal inertia. This fact justifies using of averaged atmospheric and surface temperatures as criteria of the climate state. The core and the cover are in the convective and radiative heat exchange with each other. The cover is partially transparent for the core heat radiation and also gives the heat energy with the radiation to the open space itself. 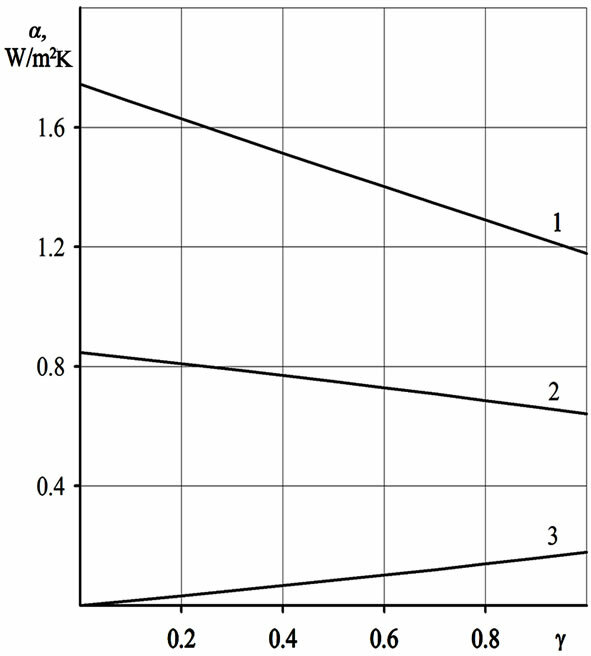 The developed equivalent scheme is shown in Figure 1 Three levels are notable: the first level corresponds to the surface with the highest temperature Тs, the second level corresponds to the atmospheric averaged on volume temperature Та, and the third one corresponds to the open space temperature Тe assumed equals to zero, Тe = 0K. The biggest part of the surface is the ocean, so we use the heat capacity of the ocean describing transient behavior. Heat sources Qs and Qa are analogues of current sources: Qs—specific power of the heat emission on the surfaces of the land and the ocean; Qa—specific power of the heat emission in the atmosphere. Sources of the temperature force, which are analogues of voltage, are omitted on the scheme as temperatures Тs and Та are potentials depending on scheme parameters. Surface capacities of the ocean and the atmosphere Сs and Са in J/m2K are analogues of the electrical capacity. Nodes are connected with conductivities, through its specific heat fluxes qi are flowing. Radiative conductivities αs, αa, αr presents as electrical resistance usually presents. The black frame denotes the specific heat conductivity α, which is resultant total convective and evaporating-condensation coefficient of the heat transfer from the ocean surface to the atmosphere in W/m2K. Flux qs is a radiative flux transferred from the ocean surface to the open space directly through atmospheric window. Specific flux qа is defining power of the heat radiation from the atmosphere to the open space, and qr is the resultant radiative flux between the ocean and the atmosphere and it describes difference between fluxes transferred with the radiation from the ocean surface to the atmosphere and from the atmosphere to the ocean. Specific heat flux q is a resultant flux transferred by the convection and evaporating-condensation mechanism from the ocean to the atmosphere. tent in the atmosphere and the ocean mixed layer is taking into account with the flux from the capacities Cs and Ca. The isothermal active layer can be allocated for the ocean with the layer thickness lo, it depth depends on the convective hashing of water in it. For the land it is necessary to take into account unevenness of temperature distribution in the soil thickness, it is attained with using the transient heat equation. On this stage we don’t consider this problem, because the electrical circuit analogy can’t be used to solve it. • atmospheric transmission for IR spectral range taking into account with it averaged values for atmospheric windows (main atmospheric window is the range 8.13 µm) . There are two main reasons to use this model to analysis of the climatic global trends. First, the ocean is the main part of the surface (more then 75% of it). The ocean has a very big thermal inertia caused by its very big thermal capacity. As it shown below, the constant of thermal inertia is about 8.5 years or more. As result, the surface temperature doesn’t change seriously during one day for both lighted and shadowed parts of the surface. That’s why the averaged temperature of surface can be used. This fact presents on the scheme with node having temperature Ts. The values of the atmospheric density and the atmospheric capacity are an additional factor to the first one described above. Both factors make it valid and efficient to investigate the global climatic trends with the model based on the equivalent thermal scheme, which is build with electrical circuit analogy. Surface dencities of total capacities Ci are defined from rates Ci = CΣi/Si. Here αij and αie—conductivities for heat transfer from body no. i to body no. j and from body no. i to environment, respectively; Ti, Tj and Te—absolute temperature of bodies i, j and environment. In the beginning we use the simplified steady-state situation corresponded to the mathematical description (3) of the scheme in Figure 1. This system (5) contains the four unknowns (qr, q, qa, qs) and two equations, so it can’t be solved unequivocally. 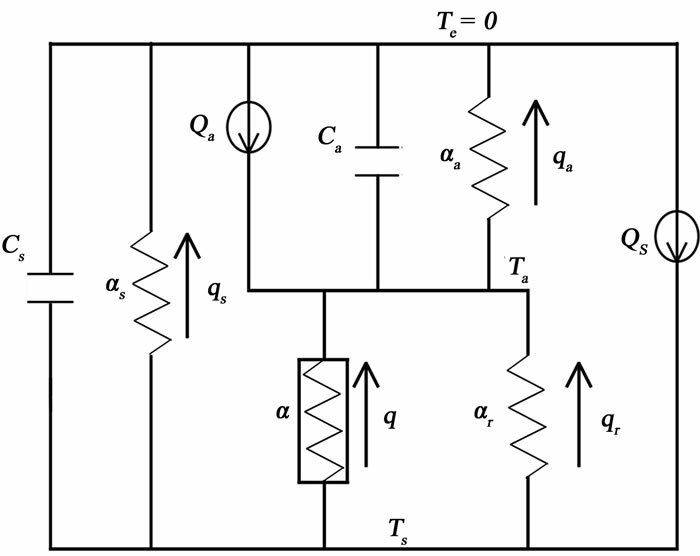 However, for the heat circuit the problem is simplified as parameters of this circuit (αr, αa, αs) are estimated definitely throw the potentials—temperatures Ts and Ta. Here εa, εs—emissivities of the atmosphere and the ocean; F—transfer factor for the system of the ocean--the atmosphere; δs—the fraction of the ocean emissive power contained in atmospheric windows; δa—the fraction of the atmospheric emissive power contained in atmospheric windows; σ = 5.67·10-8 W/m2K4—the StefanBoltzmann constant; γ—atmospheric transmission for the heat radiation in atmospheric windows. As it follows from (7), scheme in Figure 1 is considerably nonlinear because the scheme parameters αi depends sharply on the temperatures. To solve the system (8), initial conditions must be adopted, and the set of parameters satisfied to known components of the heat balance Qa, Qs, qs, and Тs must be defined. It is important to establish the conductivities α correctly. It depends on small variations of Ts and Ta weakly. Arrhenius  examined the surface only without analysis of atmospheric temperature situation. He assumed the convective—mass-transfer flux q to be constant. 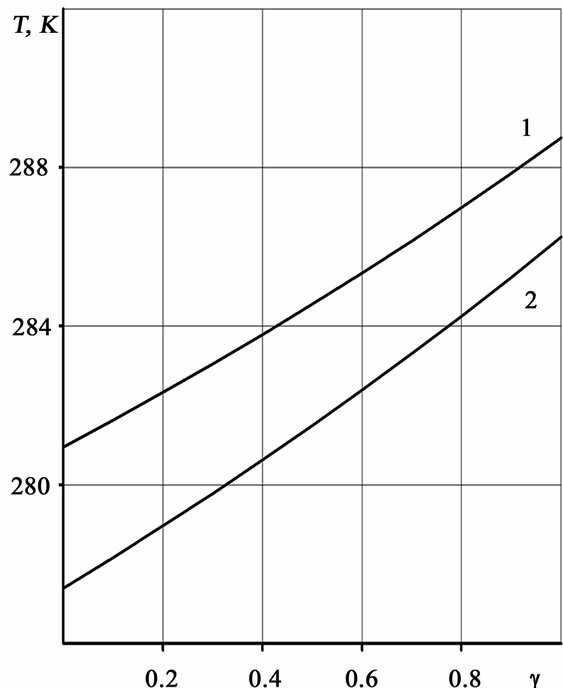 However, as it shows below, condition α = const is more correct. 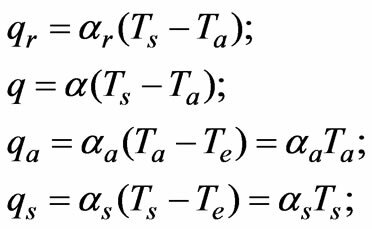 Initial value of α defined from heat transfer equations depends on key parameters included in systems (8) and (5), but it is assumed that α is constant in following calculations of the dependence of Ts and Ta on variations of any parameter. Following values were chosen as initial defining components of the heat balance  Qs = 168 W/m2; Qa = 67 W/m2; qs = 40 W/m2; qa = 195 W/m2 and Ts = 287K . Surface heat capacity of the atmosphere is obtained from known mass and specific heat capacity of air  Cа = 107 J/m2K. For the ocean the heat capacity is obtained throw the specific heat capacity and the density, so Cs = 4.2·106lo, lo is the depth of the ocean mixed layer specified in meters. Values introduced above are enough to estimate thermal inertia characteristics of the Earth investigated as the whole planet. Impact of parameters variations should be calculated numerically in the non-linear statement of the problem to avoid errors. We begin with analysis of termoinertia characteristics of the system of the surface—the atmosphere. here t—thermal inertia constant for the system of the ocean--the atmosphere; θ—steady-state planetary temperature of the Earth; QΣ—total power of heat sources in the system of the ocean—the atmosphere; αp—planetary conductivity for heat radiation from the Earth to the space. Equation (11) makes it possible to get the very simple but reliable estimations. It is confirmed by results of our additional non-linear calculations, which makes it seen that the temperature change in time is not strictly exponential, but the duration of the transition condition is estimated exactly with the linear problem definition. Assuming the depth of the ocean mixed layer lo=50 m (accuracy of this value is not so important for demonstrative estimate), the Earth’s thermal inertia constant is obtained to be t = 8.5 years. If any key parameter (atmospheric transmission, solar constant etc.) changes in the spurts manner, the new steady-state condition would form over the time, which approximately equals to three thermal inertia values, in our case τ = 3t = 25.5 years. If key parameters changes slowly then transient process will be much longer. Next step is to find values of parameters in case of steady-state conditions—when dTi/dτ = 0. We begin with analysis of the connection among transmission γ and emissivities εs and εa. here γinit—assumed initial value of transmission, γ is vary relative to it; q*—specific heat flux from the surface with εs =1 to the space throw atmospheric window with absolute transmission γ = 1. There is a problem on this stage. To study the parameters variations impact on the temperatures from the system (8) when dTi/dτ = 0, it is necessary to define initial values of Ta and α which are desired quantity. And we should set initial values of γinit, εs and εa. However, there is indeterminacy as accurate values of these parameters are not known. To overcome the indeterminacy, we set initial value γ = 0.8 for preliminary calculations. This value looks reliably for the standard atmosphere. 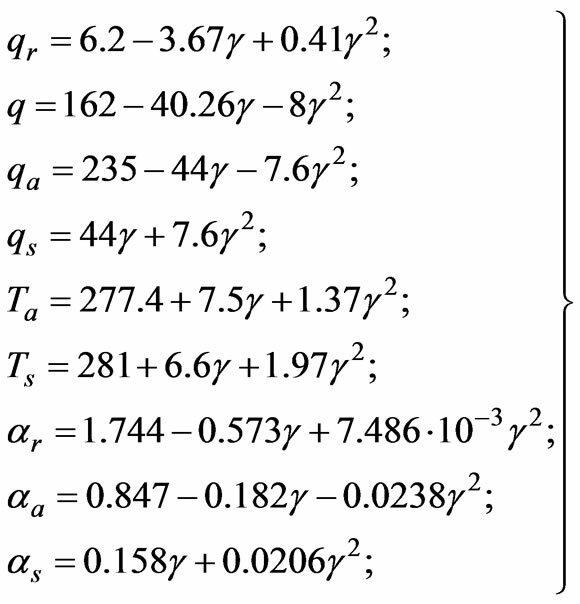 Substituting the initial parameter values in the heat balance equations, following values are obtained: Ta = 284.25K; εa = 0.7; α = 45.56 W/m2K. Value εs has been defined from (14) directly. Substituting γinit = 0.8 in (14), we obtain the required value εs = 0.417. This value satisfies the assumed heat flux throw transparency window. Assumed value of εa is arbitrary to a certain extent, but it corresponds to conceptions of planetary heat balance and planetary temperature. 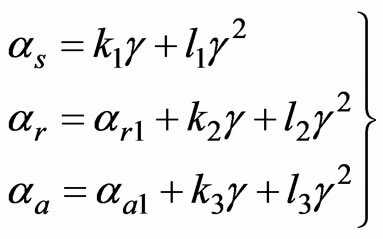 Assuming parameters values, numerical calculations has been performed how the temperatures, the heat fluxes and the heat conductivities depend on atmospheric transmission γ at steady-state conditions. 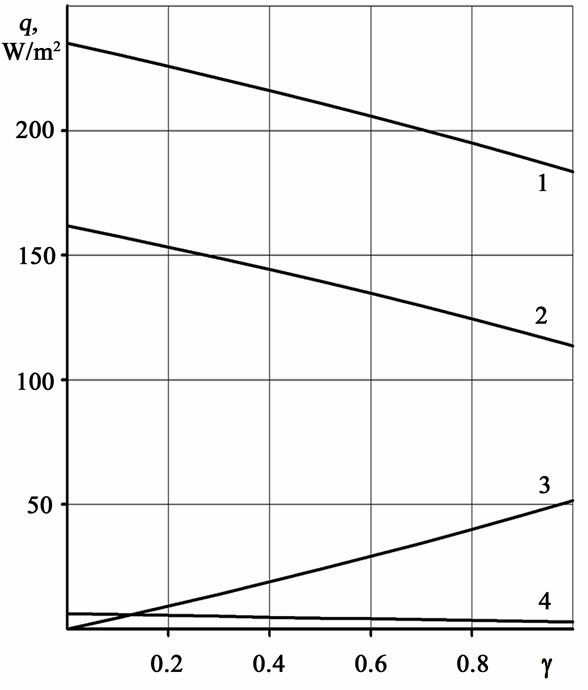 Plots in Figures 2–4 present these dependencies in all range of transmission change 0 ≤ γ ≤ 1 when conductivity between the ocean and the atmosphere α is constant. Calculations show that in case of constant heat flux q it is the intersection between temperature dependencies. This intersection doesn’t correspond to the assumption q = const. 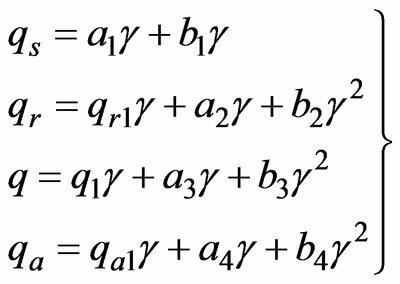 So, we use the assumption α = const in following calculations. and this heat power increases faster then the heat power absorbed by the atmosphere from the surface radiation. Note, that this result corresponds to conclusion from  obtained using the other approach. Greenhouse effect and global warming in the traditional interpretation take place in the case of the unusually heat fluxes from the surface to the space—when qs > 50 Wm2, and also in case of small initial values of γ. If the inequality εs > εa is satisfied, then decreasing of $\gamma$ would cause warming. 2) qs + qа = 235 W/m2 or qа1 + (а1 + а4)γ + (b1 + b4)γ2 = 235. 3) qs + qr + q = 168 W/m2 or q1 + qr1 + (а1 + а2 + а3)γ + (b1 + b2 + b3)γ2 = 168. 4) ΔТ = (Tr – Ta) = (Тs0 – Та0) + (с1 – с2)γ + (d1 – d2)γ2. From q = αΔТ it follows q1 + a3γ + b3γ2 = α(Тs0 – Та0) + α(с1 – с2)γ + α(d1 – d2)γ2. q1 = α(Тs0 – Та0); a3 = α(с1 – с2); b3 = α(d1 – d2). Described research has shown that it is convenient to use the electrical circuit analogy for analysis of the integral heat balance in the system of the surface—the atmosphere—the open space. Reducing of this system to the three-level scheme with lumped parameters (αi) makes the analysis more obvious. This scheme contains some indeterminacy. However, the analytical dependencies connect all coefficients of the radiative heat transfer and specific fluxes with temperatures. So, it is possible to describe the fluxes, temperatures and conductivities as dependencies on any initial parameter. Particularly, its can depend on atmospheric transmission in form (16) –(18). 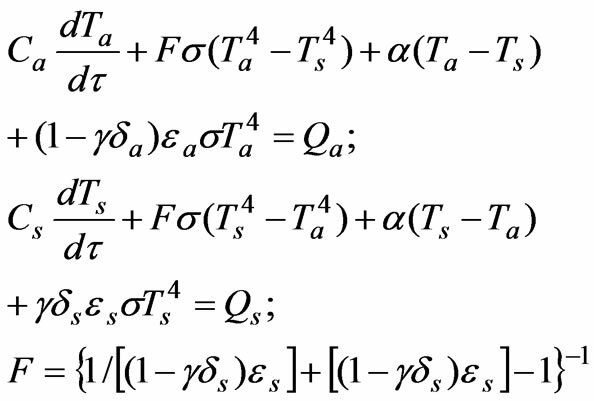 The parameters γinit and εs are connected by the ratio γinitεs = 1/3, and Ta and εa are connected by the more compound dependence on γinit, so the heat balance contains the indeterminacy in specific values of these parameters. With the more reliable values of listed parameters, there are quantitative dependencies (19). It is found that if qs ≤ 50 W/m2 and εa > εs then atmospheric transparency decreases and the averaged temperatures decrease. It can be seen from (19) that if γ decreases then qs decreases, but the flux qa from the atmosphere to the open space increases on the same value. Also the atmospheric temperature Ta decreases in spite of increasing of the resultant convective—evaporating flux q. However, q < qa, and the increasing of the flux q can’t compensate the increasing of the flux qa given by the planet to the space. The decreasing of the cover (atmospheric) temperature causes the decreasing of the core (surface) temperature. Anti-greenhouse effect realizes on this way, and the decreasing of atmospheric transmission causes global cooling. It is found as the additional result that the radiative heat transfer qr has small influence on the integral heat balance. Greenhouse effect in it traditional interpretation realizes when one of the following conditions is satisfied: qs > 50 W/m2; εs > εa; γ < 0.4. It is found that trends of the climate change caused by the increasing of the carbon dioxide emission depends on the whole set of parameters realized actually nowadays. There is the great interest to determine the values of the parameters as reliably and quickly as possible. Small changes of the basic parameter values established after 12 years  don’t influence on our results. J. T. Keihl and K. E. Trenberth, “Earth’s annual global mean energy budget,” Bulletin of the American Meteorological Society, Vol. 78, No. 2, pp. 197–208, 1997. C. N. Hewitt and A. V. Jackson, “Handbook of atmospheric science: Principles and applications,” C. N. Hewitt and A. V. Jackson, Ed., Blackwell Publishing, 2003.